St George Mining Limited (ASX: SGQ) has intensified exploration work at its priority nickel sulphide prospects, with multiple targets, including electromagnetic conductors, being generated ahead of the Phase 2 drilling programme, scheduled to commence at East Laverton, Western Australia, in early October. 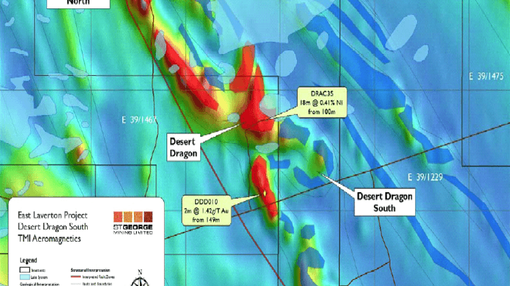 Exploration is being escalated at the Desert Dragon North, Desert Dragon South and Cambridge North prospects, situated on the fertile Stella Range belt. Follow‐up work is also being conducted over a range of prospects only partially tested by previous drilling, as well as targets established by BHP Billiton Nickel West during the previous Project Dragon farm‐in arrangement. The ongoing target generation by SGQ’s technical team highlights the large size and depth of the exploration potential at East Laverton, which covers over 2,000 square kilometres, 3 ultramafic belts, and a combined strike length of 130 kilometres. “We are actively continuing our systematic exploration of nickel sulphide targets at East Laverton. We have developed a comprehensive geological, geophysical and geochemical dataset, which is constantly being expanded with new drilling results and exploration data. The new Desert Dragon South prospect covers a geologically and structurally complex area where the district scale Churchill lineament intersects the fertile Stella Range ultramafic belt. Magnetic data indicates intense folding, thrust faulting and shearing of the ultramafic belt in this area, with Churchill orientated normally at 90 degrees to the trending rift structures that control the orientation of the greenstone belts at East Laverton. These rifts and the cross structures are a setting where the komatiite channels host greater than normal volumes of magma, and higher flow rates of the hot turbulent magnesium oxide‐rich ultramafic lava. Hot komatiite magmas are favourable for the formation of high grade nickel sulphide mineralisation, which makes these cross‐rift intersections priority exploration areas. Desert Dragon South lies immediately east of the komatiite channel flow intersected by drill hole DRAC35, which assayed 18 metres at 0.41% nickel from 100 metres. This supports the potential for the presence of fertile channel flows within the local area of Desert Dragon South. The moving loop electromagnetic survey recently completed over Desert Dragon South detected a large and complicated response with a number of flat‐lying horizons identified. The electromagnetic responses are superimposed on each other, and the number of stacked conductive horizons increase from the north to south of the survey area. They are interpreted to represent sulphide‐rich sedimentary units with potential for masked massive nickel sulphide mineralisation. In settings like Desert Dragon South, a greater reliance is placed on exploratory drilling as an initial exploration tool, with use of down‐hole electromagnetic surveys to investigate the responses at depth. The Flying Fox nickel deposit at Forrestania is underlain by sediment and is an example of a major discovery in this kind of scenario. Exploration by drilling and geophysics is being designed for Desert Dragon South as part of Phase 2 of the 2014 drilling program at East Laverton which will start next month. Ongoing field work at the Desert Dragon North prospect has indicated evidence of granite structures which are interpreted to represent a granite dome. Similar dome structures are found at the Kambalda and Widgiemooltha nickel camps. A late‐stage granite is interpreted to have intruded the base of the Stella Range ultramafic belt at the Desert Dragon North prospect. The uplift and deformation of the ultramafic belt results in the ultramafic sequences being draped over the granite, and the formation of distinct western and eastern ultramafic flanks. Deformation of this nature can be favourable for nickel sulphide mineralisation. Folding and faulting can result in the thickening of the ultramafic sequences and the repetition of target basal contacts on the dome margins. The original target area at the Desert Dragon North prospect, which includes an intersection 2 metres at 1.08% nickel, is the western flank of the Dome. Importantly, nickel deposits have been found below such granite layers after drilling through the granite and re‐emerging in ultramafic. The Nepean nickel deposit at Coolgardie is an example of this. Further soil geochemistry and field mapping is planned for Desert Dragon North to better define the granite structures in this area. SGQ is also using three‐dimensional inversions of magnetic data to map the magnetic ultramafic units and the non‐magnetic granites. This will allow a better appreciation of the complicated geological relationships within the Dome, provide a means for identifying ultramafic sequences masked by the granite and enhance drill target selection. Cambridge North is one of the SGQ’s most important nickel sulphide prospects, covering 15 kilometres of the Stella Range ultramafic belt. A MLEM survey is currently being conducted over this area by Newexco; preliminary data indicates that several strong anomalies have been detected, with data modelling continuing. The Geological Survey of Western Australia has also reported a coincident nickel-copper soil anomaly in the prospect area with values of 171 ppm nickel and 93 ppm copper. SGQ will complete a follow‐up soil survey over this area to test the extent of the anomaly. Previous explorers in this area carried out exploration for nickel laterite rather than nickel sulphides. A small nickel laterite resource of 0.19 million tonnes at 0.6 % nickel was established in 2001 by shallow drilling of less than 50 metres depth. Drilling identified thin surficial and intersected bedrock magnesium oxide values of up to 41%. The presence of high‐MgO ultramafics and thin cover sequences at Cambridge North, coupled with its location on the fertile Stella Range belt and very limited exploration to date of the bedrock, make Cambridge North high priority prospect for nickel sulphide exploration. The ongoing regional MLEM survey at the East Laverton Property has identified electromagnetic anomalies on each of the three ultramafic belts across the project area. Only a small number of these anomalies on the Stella Range belt were tested in the Phase 1 drilling program earlier this year. The assessment and interpretation of the remainder of the conductors is continuing, using all available geological, geochemical and geophysical information as well as data from the recent drilling program. The MLEM survey has now been completed at the Bristol and Athena nickel sulphide prospects, and is currently at Cambridge North, which will be followed by Aphrodite and the eastern flank of the Desert Dragon North Dome. SGQ expects the review of anomalies to result in the generation of additional nickel sulphide drill targets which will be prioritised for drilling.